being little • bristol uk fashion & lifestyle blog. 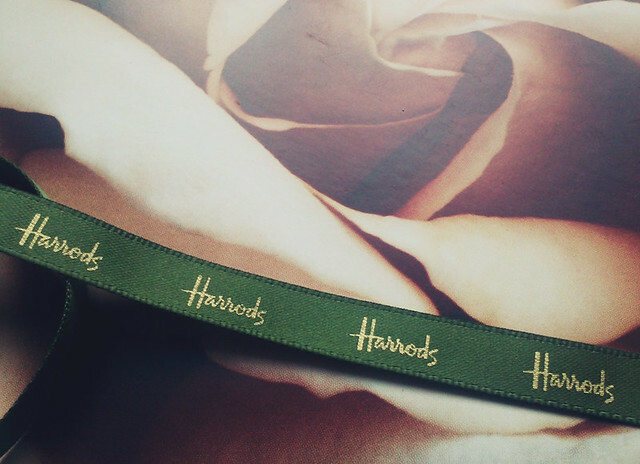 : glossybox//harrods. VALENTINO - VALENTINA EAU DE PARFUM • MOLTON BROWN - VITALISING VITAMIN AB+C BATH & SHOWER • SKII - SKIN SIGNATURE • LANCOME - HYPNOSE DRAMA MASCARA • CLARINS - EXTRA-FIRMING BODY CREAM • SHU UEMURA - CLEANSING BEAUTY OIL. This month's limited edition box is a collaboration wth Harrods, and contains six lovely products! (One more than usual) There are only a limited number, and I'm not sure if there are any left, but you should be able to find out on the GlossyBox website. After being pretty disappointed with the last box I received, I wasn't expecting much from this one, despite it being s special Harrods one. But I have been very pleasantly surprised! Molton Brown Bath & Shower I used this first and it smelled sooo yummy and left my skin feeling quite nice. Clarins Body Cream I use a moisturiser after every shower as I get really dry skin, but this left my skin feeling quite greasy. I think you'd have to use it for quite a while to see any firmingness, and I don't think this sample would last long, so I can't comment on that! Skii Moisturiser I used a tiny bit of this after the oil, and my skin felt amazing. Valentino Perfume I looove this! I'd describe it as a very girly scent. I love getting these little perfumes, as they're so good to carry around in your bag! There was also a little magazine in the bottom of the box, full of pretty pictures of fancy products I don't think I'll ever be able to afford! 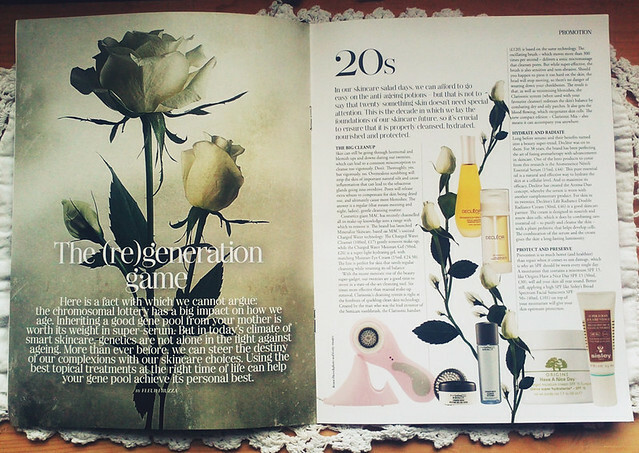 There was also advice on skincare for when you're in your 20s, 30s, 40s and 50s! Pretty interesting. All in all, a really good box this month! I'd highly recommend trying to get one for yourself if you haven't already! 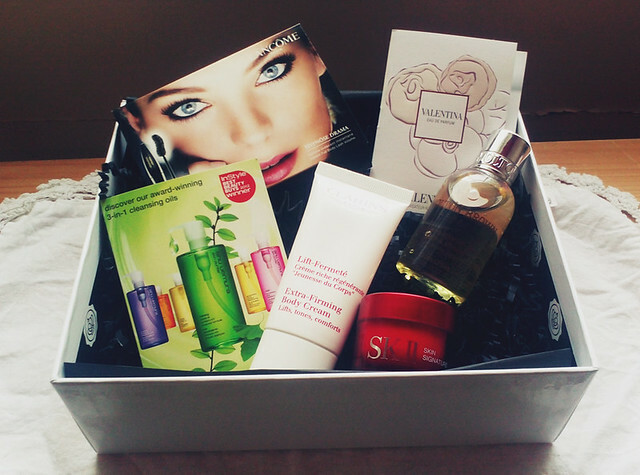 Have you tried GlossyBox? What are your thoughts? I really liked the Molton Brown shower gel! Owh, we got the same box! Kind of regret handing over the Skii moisturiser to mum straight away without testing it for myself first. I kind of agree with you about the Clarins sample too, I think it's actually an okay consistency on my skin, but there's just not enough of it meaning there's not enough to really notice a result. Now that's a sweet care package. Love that rose photo in the magazine. You got the same box as me. I thought it was good but not worth all the hype. Still im getting through what I recieved! What a lovely selection! One day I am going to give in and subscribe to glossybox..sorry purse! I got the same box! I'm so happy with it and quite pleased as this was my first Glossy Box.